The news is not good: Wisconsin’s abortion numbers have increased by 3.7 percent, rising from 5,612 in 2016 to 5,818 in 2017. 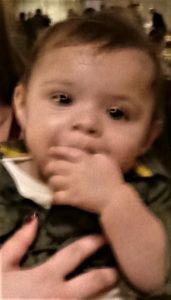 206 more babies died in 2017 from abortion than in 2016. 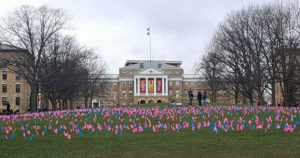 That means 206 lives lost, 206 moms who now live with the regret of abortion, and countless other lives touched by the loss of these 206 unique individuals. While this news is discouraging, it’s not surprising. After Planned Parenthood opened a brand-new, state-of-the-art abortion clinic in 2017 we were all on high alert that abortion numbers would be rising. Planned Parenthood is winning the war on messaging. We need to know the facts about alternatives to abortion. What do I mean by this? Aren’t we out there sharing the truth about abortion and lifesaving alternatives? Yes, we are out there sharing the message of alternatives to abortion, what abortion is, and what a woman can do if she is facing a crisis pregnancy. Unfortunately, our ability to reach our target audience is limited, at best. We don’t have the mainstream media sharing the great work that local pregnancy centers are doing. 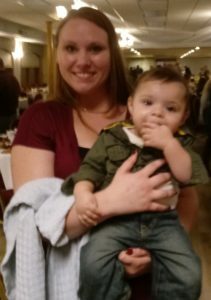 No news outlets promote the fact that Wisconsin Right to Life works with pregnancy resource centers to provide grants which help women facing immediate financial crisis. They don’t show how college groups are working to remove obstacles so mom or dad can go to college and raise their baby at the same time. There are no inspiring feature stories on women climbing the corporate ladder at work while raising unexpected babies. No, you won’t see the possibilities of life in mainstream media. The abortion industry has a built-in megaphone from the mainstream media — they are the darling of most news outlets and reporters. The mainstream media continuously sells the falsehood that anti-abortion groups are just out to restrict access to abortion and they only care about babies before they are born. Sure, that sells abortions, but it certainly doesn’t sell the truth to the average person watching or listening. Planned Parenthood has spent years perfecting the message that they are there when a person needs healthcare. We hear over and over again that if Planned Parenthood is not there to provide services, thousands of people will go without cancer screenings, STD testing, family planning, and so much more. The truth is, there are more federally-qualified health care centers across our state than Planned Parenthood clinics. And, many of them are now offering services which include STD testing, family planning options, as well as parenting classes. In addition, Planned Parenthood has millions of dollars to spend on the best public relations firms, advertising agencies, and others who have helped perfect their branding and messaging. Their marketing is a well-oiled machine. Their slick messaging is a spider’s web of misrepresentations that snare the uninformed. For us to keep fighting Planned Parenthood and their messaging, we need you. We need you to share our information. We need you to talk about life-affirming abortion alternatives. We need you to debunk the myths Planned Parenthood continues to share about alternative healthcare providers. And we need your financial support so we can push our message out to more platforms. A second point you all need to know about are alternatives to abortion. Do you know where to go to find information for pregnancy centers in your area? If not, you need to learn about 123GiveLife.com. Not familiar with this site? Go there and see for yourself what it is! I’ll give you a preview: visitors to the site simply type in their zip code and all the surrounding pregnancy resource centers appear on their phone, tablet, or desktop computer. 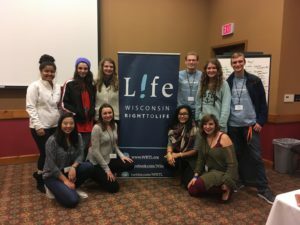 Wisconsin Right to Life maintains and promotes this site through our Veritas Society media campaign. Women facing a crisis pregnancy need immediate access to abortion alternatives from an easy-to-find source. 123GiveLife.com provides this! Over the years, Wisconsin Right to Life has maintained a database of pregnancy resource centers across the state. This database is updated on a regular basis so that when a woman finds herself in need, she can easily find the resources and answers she is searching for. Through the Veritas Society, we produce advertisements that are on digital media promoting abortion alternatives, in addition to purchasing Google AdWords to push women to these alternatives. Can you imagine being in a moment of crisis then finding the help you desperately need on the internet? The questions is, though, what’s going to show up when you do a Google search? Google AdWords ensure that women can find life-affirming choices rather than just abortion clinics. We need you to be the person who can share this information with your friends, with other parents who might have teenagers that find themselves pregnant, with members of your church, and with anyone else who might need it! Tell everyone you know about 123GiveLife.com! You also need to know where to go to get truthful information on the development of an unborn baby, what happens during an abortion procedure, and what happens after an abortion. All of this information can be found at our website and at pregnancy resource centers. Guess where you won’t find it? That’s right, at an abortion clinic. Our website, of course, is www.wrtl.org. I understand you might think that statement is limited to another cause of action, but it certainly applies here. Over the last couple years my concern has grown that, as pro-lifers, we are not aware of what is happening in our own communities. Two examples: The first is the building of an $8 million Planned Parenthood clinic in Milwaukee’s Third Ward. I admit, I work in Milwaukee, yet I didn’t know this clinic was being built until I read the article on JSOnline that is was set to open. How could we have missed this? How was it that no one knew about a purchase of property, building permits being pulled, fundraising happening, different activity taking place at Planned Parenthood’s other location? Were our heads buried in the sand? If you see something, say something. Do not ever assume that people know about what is happening around you. The second is the re-opening of Planned Parenthood in Sheboygan. They are back open for business and I’m fairly certain they are making a lot of money there. This clinic provides RU-486 abortions. These are quick procedures, which means more money in the pocket of Planned Parenthood. Unless there is a complication with the RU-486 abortion there is no surgery, so not a lot of time needs to be spent with clients. With RU-486, women complete their abortions at home and must deal with their pain and blood as well as the bodies of their dead babies on their own. This is no problem for Planned Parenthood – they can profit from their killing quickly and without much bother. Again, how did we miss this Planned Parenthood clinic opening in Sheboygan? Did someone see a new tenant moving in a building? Did someone see a permit being pulled for occupancy? I realize that we aren’t all in a position to see these things, but if you are, tell someone. Did you overhear a conversation at your local coffee shop about an abortion clinic opening? If you did, share it! Call me; this is what I need to hear. Call your local group and devise a plan to share the news. Even when it is bad news, we need to share it. We need to share the news because it is our job to ensure that all lives are protected. The increase in abortion numbers only exemplifies the need for our work to continue. We need to be the voice for those who have no voice, but we also need to be the voice of truth. Join with us in countering the ever-powerful abortion industry in messaging, knowing about alternatives to abortion, and being on the front lines of knowing what is happening in our communities. For their lives, our work continues! 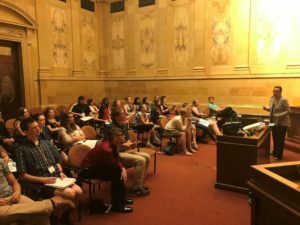 The Wisconsin Right to Life Education Fund is a 501(c)3 entity and all gifts are fully-tax deductible. 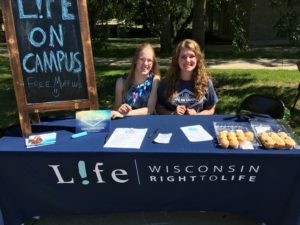 “As disappointed as I am in seeing an increase in abortion numbers in Wisconsin, it really didn’t come as a surprise,” shared Heather Weininger, Executive Director of Wisconsin Right to Life. “After a brand-new, state-of-the-art abortion clinic opened in Milwaukee’s trendy Third Ward we should have all been on high alert that abortions were soon to be on the upward climb. “For too many years, Planned Parenthood was seeing a decline in their revenue and they were ready at every turn to reverse the downturn in profits. For years we have heard Planned Parenthood saying the pro-life movement is limiting access to abortion. It looks like the abortion industry has gotten what it wanted: More unborn babies being murdered, and more women who will suffer the devastating consequences of abortion. 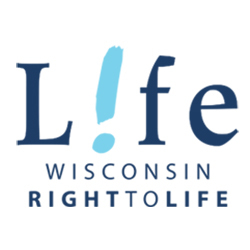 “Wisconsin Right to Life will keep working to ensure women aren’t coerced into abortions. We will make sure women know that there are life-affirming alternatives to abortion. 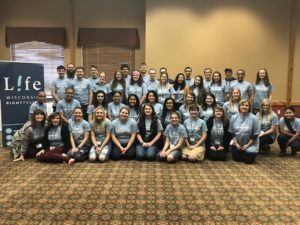 We will work with pregnancy resource centers across the state to ensure women in crisis have help available to them, and we will continue to work on passing protective, pro-life legislation that ensures women know the truth about abortion and have real choices for themselves as well as their children. For 50 years, Wisconsin Right to Life has been the pro-life leader in our state. 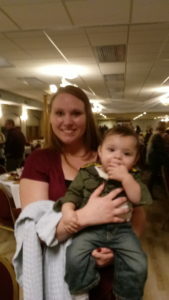 We continue to promote the truth about life and the many alternatives to abortion available in Wisconsin. It took me a while to digest the results of last Tuesday and compile my thoughts that I wanted to share with others. On Tuesday, November 6th the pro-life movement was dealt a set-back, but, fortunately, it was not an end-of-the world scenario. I have to admit, this one was quite personal to me. In 2010, my husband was elected to his first term in the Wisconsin State Assembly. It was a time when we knew there were going to be many bold changes coming our way. And, big bold changes did come to Wisconsin. Also during this time, we were able to pass even more protections for the unborn. When I first heard that our great pro-life Governor Scott Walker was in a tight race, I thought to myself how could people of the State of Wisconsin want to return to a time of deficits while taxpayer dollars were being used to fund abortions? How could people in Wisconsin want someone in office who doesn’t protect the most vulnerable? Well, now we are faced with a time when we will not have a Governor who will sign into law pro-life legislation, nor will we have a Lt. Governor who speaks on behalf of the unborn, or and an Attorney General who will stand up for life in the courts. Let’s be real, this is a tough realization, but one that we need to get past in order to move forward. While we are now going to have four years of someone who does not believe in the sanctity of life, it is reassuring to know that we have the State Senate and Assembly in control of pro-life legislators. I see these coming four years as a time during which we will educate Wisconsinites on the devastation caused by abortion and the need to protect the most vulnerable at all stages of life. Our work at Wisconsin Right to Life will not change. We will continue to introduce legislation to protect the unborn, we will continue to educate the youth in our state about life, we will continue to work to change hearts and minds to favor life. We cannot let one election cycle hold us down for too long. There is far too much work to be done to protect unborn babies and all vulnerable individuals from the moment of conception until natural death. Stay tuned to learn the specifics of what we will be working on in 2019.